Wouldn't it be nice to have a computer that would be completely silent? How about one that also is High-End? This is what I asked myself, I wanted one. This means ... not fans ... no pumps ... how do you do that? First lead. Heatpipes. They do that. Efficiently transfer heat from one place to another. Are they just rods of metals like they seem to be? No. They are filled with a "coolant". A fluid that, if it's kept under some pressure, boils at room temperature. They are also lined with gel that allows liquid coolant to climb up a heatpipe. Nice. Yes, other systems use those to connect computer components to a big heat sink ... looking around at retail available system makes it clear though. They fulfil the first part. But often are limited on what CPU you could use. Limited TDP and such. But wait. Coolant is used in more places. It's used in refrigerators, in AC units for cars and homes/stores. Phase Change Cooling. They sure need to have more cooling power. But they are also loud. They have fans and compressors and valves, Active parts ... What if you take all that away. Would it still work? Passive Phase Change Cooling? After some research and thought experiments I came to the conclusion: Yes! With some restrictions. A passive system can't cool below room temperature, like a Heatpipe, and in its fluid form it can't climb up, unlike a Heatpipe. So unlike with a watercooled system you can't route the pipes however you want, there isn't a pump to force the liquid around loops. A cooling loop is built with a radiator at the top and a vaporizer (it's pretty much a waterblock) somewhere below it. The output of the vaporizer is connected upwards towards the input of the radiator. The radiator is angled so that when the vapor condenses it flows towards its output. The output of the radiator is connected downward towards the input of the vaporizer. The cooling loop is evacuated of air. Coolant is put into the loop. The vaporizer is heated above room temperature. Liquid coolant is vaporized inside the vaporizer. Vaporized coolant climbs upwards trough the piping into the radiator. The radiator is cooled by convection. Vaporized coolant condenses inside the radiator. Condensed coolant flows downwards out of the radiator trough the piping into the vaporizer. The coolant reaches equilibrium again. The coolant is influenced by three factors: Pressure, Temperature and Gravity. The coolants boiling temperature is heavily influenced by pressure. Close to vacuum means that it pretty much instantly evaporates. Until the pressure is so high that the boiling temperature is equal to the room temperature. This is when the system reaches equilibrium. The equilibrium when the system is running adds another variable. How well the heat energy can be dissipated. This too is self regulating though. As boiling temperature and thus the temperature of the evaporated coolant rises the efficiency of the radiator increases too! The higher the difference between ambient temperature and gas temperature is (ΔT), the more efficient the radiator gets. The pressure and thus the temperature of the loop will rise until the efficiency is high enough to dissipate all the heat put into the system by the evaporator(s). Until this point is reached the imbalance will generate more gas and than gas has lower density as liquid, more pressure, thus increasing the boiling point. Once the equilibrium is reached, the amount of gas and thus pressure in the system will stay constant, same amount of coolant being evaporated and liquefied at the same rate. So why does this even work? The flow must be minimal. How does all the heat get transferred? That's the trick of Phase Change cooling. There's an invisible energy needed to turn a liquid into a gas. This energy is visualised in the above diagram by the area inside the arc. For instance. If you want to change a kilogram of R134a from a liquid to a gas at 20°C and 0.6 MPa you would need about 190kJ of Energy. 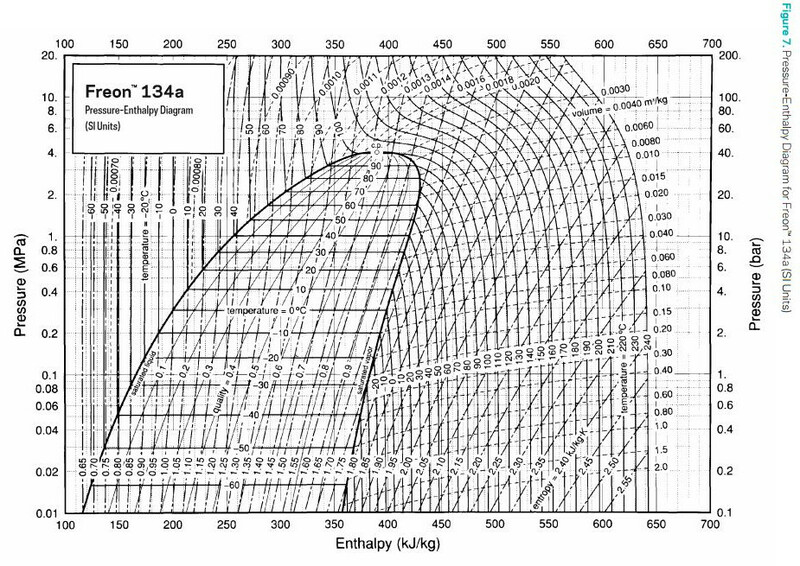 You can use the same diagram to see how much you would get by classical Heat Exchange cooling. If we would take a kilogram of R134a, for instance in a cooling loop and have it absorb 10°C, from 20°C to 30°C. It would only absorb about 10kJ of Energy. A lot less. Granted Water has a much better general enthalpy curve but it still can't reach Phase Change levels just with Heat Exchange.